This Black Plastic Folding Chair is the choice of many event planners and rental companies for their lightweight design, ease of cleaning and versatility among events. Manufactured using high-impact plastic and 18-gauge powder coated metal frames, the black plastic folding chair is suitable for both indoor and outdoor events. With a weight capacity up to 250 pounds, the black plastic folding chair is built to last a lifetime. 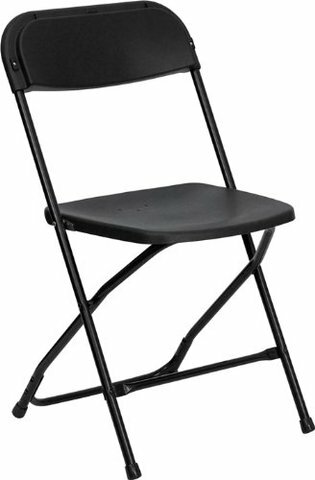 Whether it's a graduation, school function, birthday party, wedding, or family reunion, this quality folding chair provides a simple and comfortable solution for any function that requires reliable seating. $1.25/each plus tax per day.